Reading and writing are critical life skills. Children who are successful readers and writers since young tend to be successful in academic work and ultimately in professional vocation. The general perception is that children learn to read and write in preschool or even in Primary 1. Well, it is true that children learn to actually read and write in preschool, but what happens before that plays a big role in how easily they learn and how well they perform in reading and writing tasks. Research has indicated that children with good speech and language skills are better prepared to learn to read and write. There are many ways that parents can prime their children for success in school, and many of those can be done by fostering early literacy skills in a fun way. Early literacy is what children know about reading and writing before they learn to read and write. 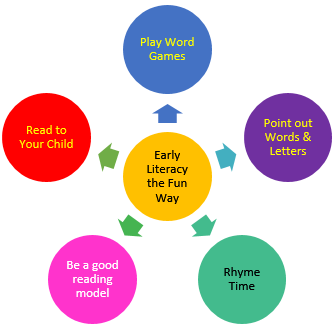 Early literacy skills can actually be fostered by parents and teachers while children are at very young age. Even toddlers and children who are not yet attending school which is between 2 to 5 years old will benefit from promoting early literacy skills. A child’s work is play, and children learn best when they are having fun. In fact, all of us learn better when we enjoy what we are doing. Same goes for introducing early literacy skills to children. Early literacy skills are critical because it determines how well children learn to read and write later on. Children who have good early literacy skills find it easier to learn to read and write, have better reading and writing skills, and this helps them to do well in school and beyond. There are numerous ways that parents can encourage good early literacy skills the fun way. Here are five suggestions to get you started. Get creative, have fun and your child will be on their way to becoming great readers and writers. One of the most enjoyable ways to introduce children to early literacy concepts is by playing games that involve letters and words. Children learn best when they are not actually learning. Direct teaching has its place, but having fun and incorporating learning into games is a great way for children to learn early literacy skills. Some examples of games are “I spy”, Scrabble, Boggle, and Upwards. “I spy” goes like this: someone says, “I spy with my little eyes something that starts with the letter “j”, then the others try to guess what it is. It could be “jam” or ‘jar’. Instead of the name of the letter, use the sound, which will be helpful for young children. For example, “I spy with my little eyes something that starts with the ‘buh’ (b) sound” and the answer could be a ball or a book nearby. Highlight the sounds that words start with and have fun playing the game. Most commercial word games like Boggle and Scrabble have a junior version now, making classic favourites easier and suitable for younger children, introducing them to words and letters in a fun and exciting game. Keep a set of games handy for rainy days indoors and remember to pack a word game on your next family trip! Besides games, another natural, practical, yet fun way of encouraging early literacy skills is by pointing out words and ABCs anywhere and everywhere they appear. In order for children to learn to read and write, they need to recognize what print looks like. We do not suggest that you teach 2 or 3 year old children how to read, but just begin to introduce the concept of print to them, to create an awareness of print. It’s easy to start to point out common logos like KFC and McDonalds as these are readily available and children are familiar with these logos. Use an excited and animated voice to point out these words, letters and logos. Parents can also point out letters and words on children’s toys, clothes, and food packaging. Always remember that the goal is not really to teach them to read these words, but rather just an introduction to the wonderful world of words. Children will learn to identify these words and logos and know that it means something, which is the foundation of what reading is all about – letters and words put together to mean something. So keep a look out for opportunities to point out words and letters to young children, and wait for them to start pointing out words and letters to you in no time! Reading is made up of making sense of the various sounds or phonemes that exist in a language. The sounds we speak and hear are the same sounds we read and write. That’s why it’s extremely important for children to have a strong foundation in speech sounds. A great way to encourage this is by rhyming. Rhyming is like miming, fun and amusing. Children find it funny to hear and say words that are different yet sound alike. You can rhyme words that have the same ending sound, like cat, mat, bat, fat. It’s fun to put it all together to form a sentence, like “The fat cat sat on a mat”. It’s also exciting to come up with words that start with the same sound. For example words that start with the ‘puh’ (P) sound, like pen, pineapple, pillow peacock, and even make up silly sentences with all or most of the words starting with the same sound, like “Polly the peacock put her pineapple pen on the pink pillow”. Rhyming emphasizes speech sounds and makes children aware of this concept. They learn to group similar sounds together, and this is a very handy skill when they learn reading and writing later on. Rhyming can be done anywhere and everywhere. Liven up long road trips by starting to rhyme in the car, train, bus, or plane. Don’t let waiting for food to arrive at a restaurant be boring, use the time to rhyme instead, and try to include food items as the theme of your rhyme. Read and sing well known children’s nursery rhymes together as this is a great example of rhyming should sound like. Most importantly, keep it funny, keep it silly, keep it rhyming! Children learn by observing what the adults around them are doing. Action speaks louder than words. We can teach and encourage children with various methods and strategies, but ultimately what they pick up is what they are exposed to. To raise a reader, let them see you reading. To raise a writer, let them see you writing. Make it a point to spend time everyday reading something, anything. Let your children see you reading books, newspapers and magazines, and point out to them what you are doing and why you are doing it. Same goes for writing. Let your children see you as you write down their name to label their books, or write a shopping list, or address an envelope. Talk to them about what you are doing and encourage them to join in, even if it’s just pretend play or scribbling. Watching the important adults in their life using reading and writing in meaningful and important ways sends a powerful message to kids. It shows them that literacy is cool and useful. Getting them involved in your reading and writing from a young age will be even better. It shows them that they too, can be a part of this cool and fun and grown up world of reading and writing. Go on, pick up that book, enjoy reading, you may just inspire your children to do the same. Last but not least, to instil good early literacy skills we need to read to children. Even babies and very young children enjoy being read to. Choose books that have lots of colourful pictures. If you have a few books, let your child choose which book she would like to look at. Sit comfortably, choose a time when both you and your child are calm and happy. Use an animated voice and act out the story where possible. Ask a few simple questions based on the story, and eventually ask your child to retell parts of the story after you have read to her. Reading with your child gives the opportunity for her to be acquainted with books, to learn and experience how to turn the pages, to know which way to hold the book. All these are important pre – reading skills, or early literacy skills which prepares a child to learn to read. Reading with children creates a strong positive experience with books and plants the seeds of love for reading and writing. Always remember to schedule in reading time into our busy schedules, as some things, like reading together, cannot be missed or postponed. These are just some suggestions, and we hope you have found them beneficial. The list of activities that can be done to promote early literacy skills is endless. Bear in mind that the activity needs to be fun and meaningful, and encourages awareness of reading and writing in a positive light. There is a saying that goes “Children are made readers on the laps of their parents”. How true, as early literacy skills developed at home by parents pave the way for successful reading, writing and learning skills. So do have fun with these useful tips to develop early literacy skills, and get set to enjoy life-long reading, writing and learning.